Corruption is the main cause we are not having peace in Afghanistan and Iraq for decades. The system of ‘pay as you go’ contractors hired or created by the companies owned by the high and mighty in USA is actually the root cause of death and destructions in Afghanistan and Pakistan. In response to my question a former senior Afghan diplomat said: “We cannot compare Afghan re construction program with US Marshal Program in Germany as there were no contractors and sub-contractors were involved unlike Afghanistan. The US money was given direct to the German Government which is not the case in Afghanistan’. He was speaking at a seminar in London at University College London. According to Linda J. Bilmes, a Harvard professor, estimated in a report that US wars in Afghanistan and Iraq will cost taxpayers $4-$6 trillion until March 2014 (the research took into account the medical rehabilitation of injured veterans, as well as costly repairs to a military drained by more than a decade of dual-front fighting). Moreover, US fingers are always pointed at others no matter what, so to bring them back to earth I asked a US security expert Dr Thomas H. Johnson, Associate Professor, National Security Affairs Department, Naval Postgraduate School, Monterey, CA, USA, May I ask you professor that: “at the time of terrorist attacks of 9/11/2001, USA had over 15 fully functioning intelligence agencies with billions of US$ budget at their disposal. I would like to know how many of their officials were put on trial for criminal negligence, how many were sentenced? One would have sacked chiefs of many of them. No? He was speaking at a seminar at University of London on 27th November 2017. The problem is that no one in the US media, Western Media or even Pakistani media ask these questions. Well if US and Western media don’t ask these questions that is understandable as they are ‘imbedded with the war mongers and bankers’, but what is stopping Pakistani media asking these questions and having a debate on this ‘branding and re-branding of terrorism from Mujahideen, Taliban, Al-Qaida, ISIS or Daesh’. The Rampant corruption in Afghanistan could spell disaster for USA’s reconstruction efforts after more than a decade of war in the Central Asian country, according to the Special Inspector General for Afghanistan Reconstruction. As Washington attempts to make a graceful exit from Afghanistan, the scene of its longest and most expensive war in its history, the basic lack of oversight over key reconstruction projects has led to corruption on a massive scale. It was even established that the United States, together with its allies, were paying ‘ghost workers’ in the national police force an unknown sum that was a “very significant amount of US taxpayer money,” said Special Inspector General for Afghanistan Reconstruction (SIGAR) John F. Sopko. Now many in Washington are scratching their heads, wondering how the $102 billion earmarked for Afghan reconstruction and security was wasted. But the trail of waste doesn’t end there. Sopko warned that the very future of Afghanistan was at risk of perishing if the United States failed to reign in the real enemy of corruption. “The costs in Afghanistan – both in lives lost and money spent – have been enormous,” he said. “If we don’t… get serious about corruption right now, we are putting all of the fragile gains that we have achieved in this – our longest war – at risk of failure. However, many are questioning whether the United States can continue to foot the bill for the Afghan military adventure, as well as the clean-up and reconstruction. Linda J. Bilmes, a Harvard professor, estimated in a report that US wars in Afghanistan and Iraq will cost taxpayers $4-$6 trillion (the research took into account the medical rehabilitation of injured veterans, as well as costly repairs to a military drained by more than a decade of dual-front fighting). It should as no surprise that the Afghan people regularly describe their government agencies as corrupt. “In response to a number of surveys, Afghan citizens have described the Afghan justice system and police force as particularly corrupt,” the inspector general said. Afghanistan tied with Somalia and North Korea as countries with the highest perceived levels of corruption among 177 states, according to Transparency International. Of all criminal activities in Afghanistan, however, none has flourished as much as opium production, a grim harvest that was altogether eliminated under Taliban rule. The Afghanistan Opium Survey for 2013 showed that land used for opium cultivation hit a historic high in 2013 of 516,000 acres – a 36 percent increase from 2012. Today, 19 of the country’s 34 provinces are opium producers, which has led to a surge in the number of heroin addicts across Europe, Central Asia and Russia. “This has never been witnessed before in the history of Afghanistan,” said Jean-Luc Lemahieu, the former head of the Afghanistan office of the United Nations Office on Drugs and Crime, as quoted by the New York Times. 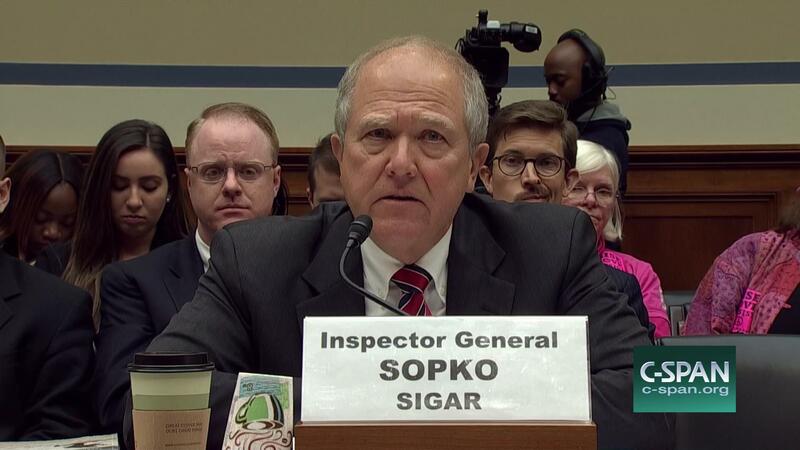 Sopko said SIGAR would continue to investigate the allegations of corruption now hampering not only the US military pull-out, but the hope for a brighter future for Afghans. Obviously, conclusion is simple that there is no transparency in US military spending and also so-called reconstruction programs in Afghanistan. However, as new development they have imported and rebranded ISIS in Afghanistan which seems to be Indo-US proxy in Afghanistan to attack neighbours like China, Iran and Pakistan.